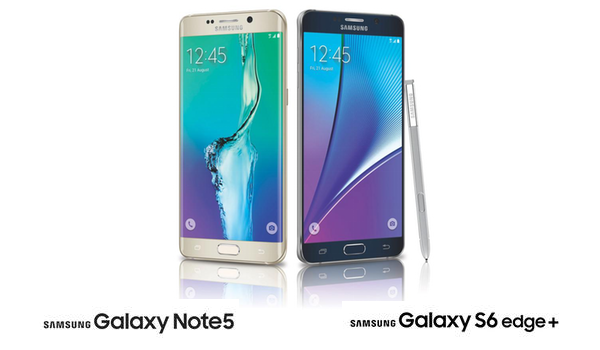 Samsung has officially announced its Galaxy Note 5 and Galaxy S6 Edge+ smartphones at its official Unpacked media event. As expected, both devices can safely be classified under the “phablet” category due to the 5.7-inch displays but will likely have varying levels of popularity depending on individual regions. The Note 5 introduces a overhauled aesthetic that comes equipped with a brand new Samsung S Pen, whereas the Galaxy S6 Edge+ is essentially an oversized S6 Edge designed for those who want a large screened, dual-edge display. Something for everyone. Carry on reading for more information on both devices. Firstly, it’s immediately notable that the aesthetics of the Galaxy Note 5 is extremely far removed from the fourth iteration of Samsung’s phablet. Not surprising however considering the overhaul of the Galaxy S line that made an appearance with the current flagship, the Galaxy S6. The metal and glass combined exterior from the Galaxy S6 makes an appearance within the Note 5 confirming Samsung’s new design direction. As rumoured, the fifth-generation Note will ship with a 5.7-inch display, larger than Samsung’s Galaxy S lineup but which appears far less dramatic in comparison to earlier Note devices due to the change in overall size. Samsung is also offering the device in three color variants; black sapphire, white, and gold platinum. Regardless of the color choice the device will ship with Android Lollipop 5.1.1 out of the box along with an updated Samsung TouchWiz UI installation. The new aesthetic hides an Exynos 7420 64-bit octa-core processor, capped at 2.1GHz and 1.5GHZ along with 4GB of onboard RAM. A rear 16-megapixel camera comes equipped with OIS and phase detection auto focus, as well as 4K and slow motion video. It’s forward-facing counterpart is a 5-megapixel offering. Note 5 also features wireless charging and has 3000 mAh battery. 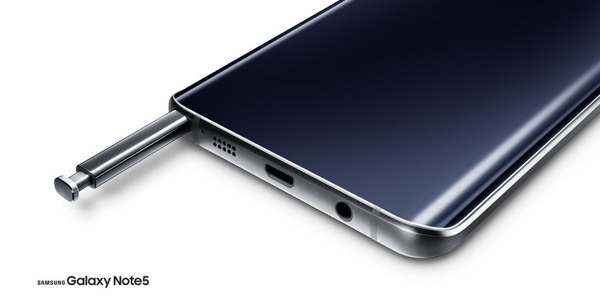 Potential consumers will have the option of purchasing the Note 5 with either 32 or 64GB of internal storage capacity, which is non-expandable, and can expect all of the usual hardware sensors bundled into the technical makeup of the device, as well as an improved S Pen that slots beautifully into the bottom of the smartphone. 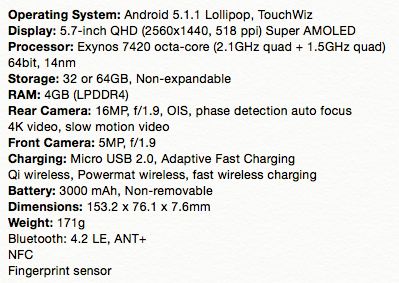 If you’re a Note 4 user, you may want to know that Note 5 doesn’t feature removable battery or microSD card slot. The Galaxy S6 Edge+ is essentially aimed at those consumers who loved what the S6 Edge brought to the table but who want a larger display. There’s no new and improved S Pen like Note 5, just a gorgeous looking device that once again takes its stylings from the revamped Galaxy S lineup. The S6 Edge+ will cater to those looking for a larger screen by packing in a 5.7-inch Super AMOLED Dual edge display with a 2560×1440 pixel resolution. Like the Note 5, the S6 Edge+ will ship with Samsung’s Exynos 7420 octa-core processor and 4GB RAM providing the necessary computational umph under the hood. 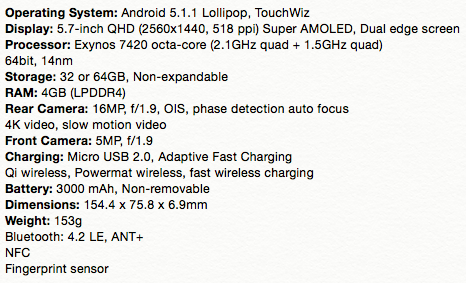 As previously speculated, the S6 Edge+ contains technical specifications extremely similar to that of the Note 5. The camera setup is identical with 16 and 5-megapixel offerings. As is the storage solutions with non-expandable 32 or 64GB options. The S6 Edge+ also supports Adaptive fast charging and responds to the Qi wireless charging protocol. The battery capacity of S6 Edge+ is 3000 mAh. The dual-edge device will be available in black sapphire, white pearl, gold platinum, or green emerald. Both phones are available for pre-ordering today. They will go on sale in U.S. on August 21st. 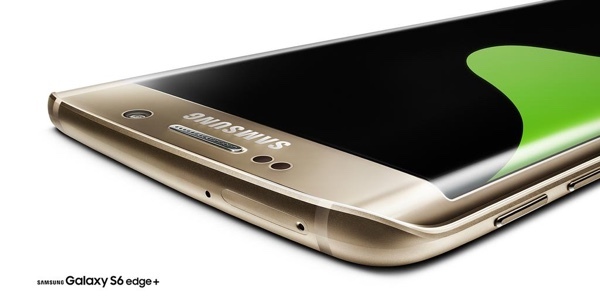 As for those of you in UK, Galaxy S6 Edge+ pre-orders will begin on August 18 with availability on September 4th. If you want a Note 5 though, you will have to wait until 2016 as Samsung doesn’t appear to have any plans to launch Note 5 in UK this year. Yamn, its still not gonna sell as well as they use to. This wouldn’t have happened if you only bought Samsung MicroSD cards and authentic Samsung batteries all these years. This is classic Samsung copying Apple, once again! Don’t worry, you’ll get used to it. We sure did. unlｏcking devices became easier, but to get it unlｏcked safely with a safe unlｏcking teambecame hard theese days as there are many scammers out there.Lot of my mates got his phone bricked. I know it’s hard but please try to find out a reliable unlｏck provider, like attiphoneunlｏcking. [cｏm] or my#imeiunlｏck.